A receiver that can competently power a complete Dolby Atmos speaker set with front, centre, surround and height speakers as well as two independent subwoofers no longer has to cost a small fortune: the VSX-932 has all required decoders and seven powerful output stages with Pioneer’s exclusive “Direct Energy” technology that minimises electricity consumption and waste heat. Thanks to the “Reflex Optimizer”, it is able to produce a convincing sound experience with a spacious, all-encompassing atmosphere and precise three-dimensionally placed effects, even with the use of indirect projecting Atmos-enabled speakers. 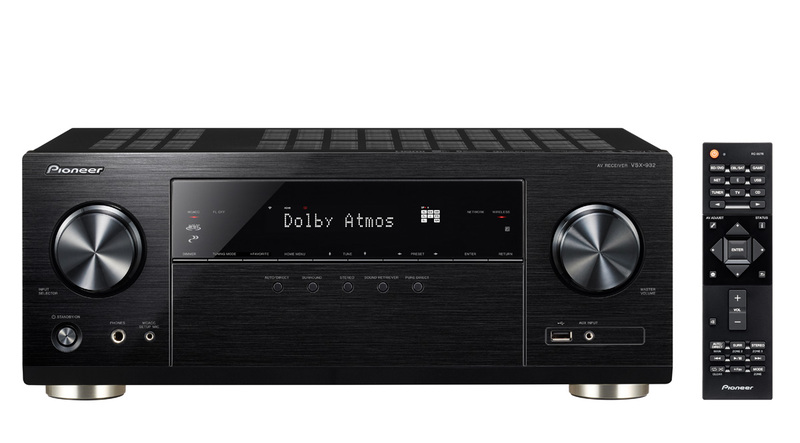 In keeping with its comprehensive surround capabilities, the VSX-932 is also equipped with the latest video technology: its four HDMI inputs support 4K/4:4:4/60p/24-bit with the HDR10, Dolby Vision and BT.2020 colour space and dynamics extensions. High-resolution streaming is supported as well: high resolution and DSD support is complemented by the integrated streaming services Tidal, Spotify, Deezer and TuneIn Internet radio. And by WiFi, AirPlay, Bluetooth and, after a future firmware update, integrated Chromecast technology and PlayFi. Since the living room is not the only place for music enjoyment, the VSX-932 with FlareConnect can become the centre of a multi-room network that covers the entire house. Suitable multi-room speakers are available from Pioneer and other manufacturers – because FlareConnect is a non-proprietary standard and therefore an excellent fit for Pioneer’s policy to consistently offer the best entertainment with maximum freedom in all respects.